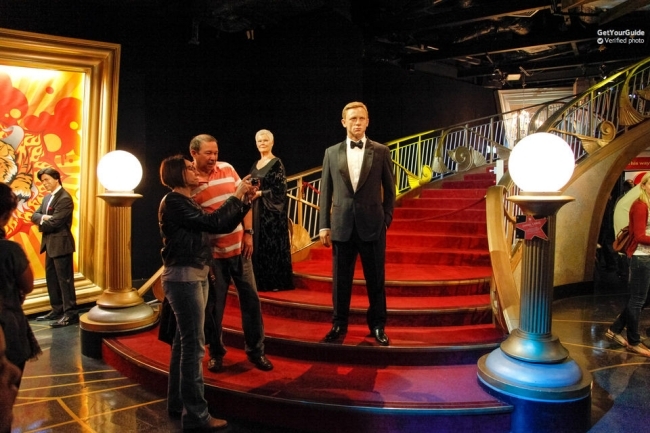 The Madame Tussauds London operates from 10 am to 4 pm on weekdays and from 9:30 am until 5 pm on weekends. This attraction is open all year. The best time to visit is in the morning in order to beat the crowds. We are comparing Madame Tussauds London and Star Wars Experience Tickets Prices from leading ticket suppliers and Try to find you Cheap tickets prices on the market. The Madame Tussauds London and Star Wars Experience Tickets is an entertainment package that allows you to enjoy three great experiences for a great price price. The Madame Tussauds Museum displays realistic wax figures of many celebrities and illustrious people, and you will have plentiful photo opportunities with them. This world-famous branch of the Madam Toussauds museum hosts wax figures of people from show business, sports, films and many other areas. Among others, you can pose for a photo with Usain Bolt, Queen Elizabeth II (the current queen), Nicole Kidman, Donald Trump, George Clooney and the Beatles. In the Star Wars section, Luke Skywalker, Princess Leia and Master Yoda. In the Marvel 4D Experience, you will get personal with Hulk, Invisible Woman and Wolverine among other heroes. Everyone who has favourite celebrities and role models will enjoy the experience in the Madame Tussauds London. Your Experience With Madame Tussauds London and Star Wars Experience Tickets? Meet your favourite celebrities and role models and have the chance to take photos with them. Appreciate the uniqueness of one of the most popular museums all over the world. Enjoy the Marvel 4D Experience that will reveal the world of superheroes to you. Enter the world of the Star Wars and get yourself acquainted with heroes of this popular film series. Among film celebrities, get eye to eye with historic personalities, politicians, superstars from various sports and many other walks of life. Once you enter the Star Wars section, you can meet Princess Leia, Master Yoda, Jedi Luke Skywalker and others. In the interactive sport zone, find yourself standing next to the likes of Usain Bolt and other famous sportsmen. What Madame Tussauds London and Star Wars Experience Tickets Includes? Entrance ticket to Madame Tussauds London package allows. Access to the Star Wars experience. If you consider yourself a bold person, head to the Chamber of Horrors. Some infamous people of the past, such as Genghis Can, Vlad the Impaler (Dracula) and Hitler await you there. Travelers Reviews about Madame Tussauds London and Star Wars Experience Tickets? Ratings from travellers who visited the Madame Tussauds Museum are constantly positive: 4.2 on Get Your Guide and 4 on TripAdvisor and Viator. In general, the travellers are quite satisfied with the overall experience. Most visitor ratings range from great to brilliant. Except for the Spirit of London ride, the rest of the Madame Tussauds Museum is wheelchair accessible. Your voucher will need to be printed or available in electronic form. Also, some purchases are final with certain providers while other ticket providers will issue refunds for cancellations made in advance. The Sherlock Holmes Experience isn't included in the price of the ticket, the surcharge for this activity is around 6€ (5£). Address: Marylebone Road, London NW1 5LR.